Commonly attributed to the indigenous cultures of the Americas, I’ve always wondered – what exactly does this look like? How can it be lived up to as more than just a slogan or ideal? There are all sorts of practical things we can do to reorient our relationship to our environment, of course. Drive a Prius, or maybe even taking up bike-riding. Buy local. Oppose GMO’s and fracking. And while each of these practical strategies is important, somehow activism and basic pragmatic steps miss the basic power of the saying. We belong to the land, it asserts. A certain intimacy is implied – a particular kind of shift in consciousness. Something that isn’t a mere abstraction that we appreciate in our minds, but an experience we embody and feel in the marrow of our bones. What does such a relationship feel like, I wondered, and wasn’t satisfied with where my imagination took me. I began to imagine romanticized images of “noble savages” on the Great Plains, stoically looking at the grandeur of the land, with perhaps another nice-sounding quote underneath about Mother Nature and Father Time. It felt fake and even glib to me, and far too muddled with my own projections. Seeking to embed myself in a more authentic relationship with a land, a place, that I had little familiarity with after having moved to California only a year ago, I made a resolution. Every single week, I’d reserve a day aside and dedicate that day to hiking – long hiking – as much hiking as I could manage to fit within daylight, and possibly beyond. In the end, I’m not sure who or what belongs to whom. But there is a relationship, I found, and in fact there always is. Moving across the landscape on foot, over the undulating hills and the dramatic ridgetops, up from the ocean and down into the valleys, I began to intuit the natural forces of the area: the wind, the fog, the precious, precious rain. A logic began to unfold to my senses, far more than to my intellect. It was, above all, an aesthetic experience. But then perhaps the divide between thinking and feeling, between sensing and intuiting is more fluid than we might initially believe. At first, my experience with the land was purely with the unbelievable beauty of it. The dark, decadent redwood canyons of Tamalpais, far removed from the crowded boardwalks of Muir Woods; the idyllic, pastoral rolling green hills of West Marin; the windswept wilderness that is Point Reyes National Seashore, with secret beaches and tunnels accessible only at low-tide. Sooner than I might have expected however, the experiences began to activate my intellect as well. 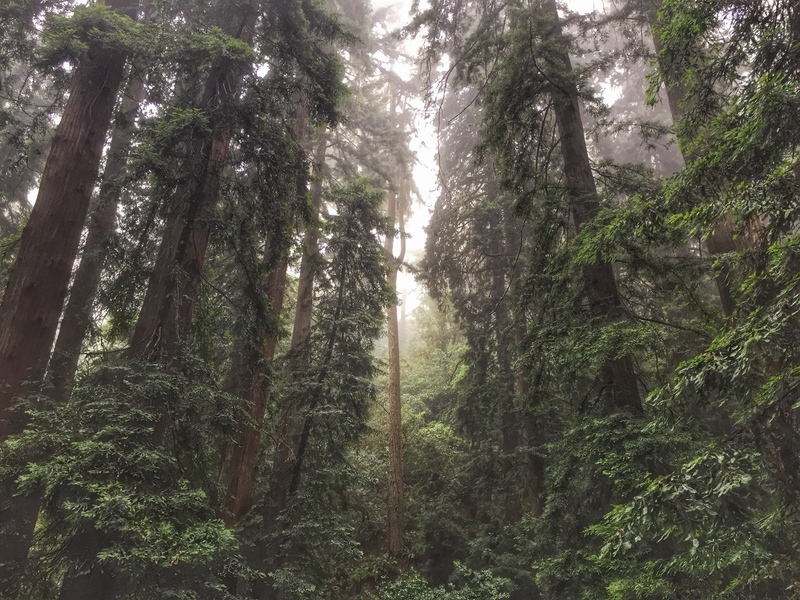 I slowly began to understand the perfect balances of forces necessary to nurture a redwood grove, for example – plentiful rain, near-constant summer fog, a perennially flowing stream and rich, alluvial soils. I had, very simply, spent enough time on and across the land to know it in a particular way. After my experience with the land began to shift away from a purely appreciative experience to an intellectual one, a more peculiar development occurred in my moral awareness. Walking the trails of the few remaining tracts of old growth left in the area, I began to feel a disgust at the effects of our destructive logging practices that I had only felt in my intellect before. Hiking up the Steep Ravine trail out of Stinson Beach and up into Mount Tamalpais State Park, the redwood giants become more immense the higher you ascend the mountain. It is perhaps fittingly ironic that just near the end of the trail, right where one encounters by far the largest tree yet, a line cuts through the landscape with a plain and uncaring vulgarity. Everything up until that line is old growth forest, and everything past it has clearly been logged. And it is here that we see the reality of the Bay as it actually exists, and not just ideally in our minds or on postcards. The Bay Area is a place exploding with natural beauty. It also a place whose natural beauty, treasures and ecosystems have been utterly ravaged – by us. Down in southern Marin County, where there is still enough exposure to the ocean air and fog to have supported what were once vast Redwood forests, lies a town called Corte Madera – Spanish for the command to “chop wood.” Just next-door to it, fittingly, bitterly, cruelly, is a town called Mill Valley. And there it is, for anybody to see. One town calls itself Chop Wood, the next town over calls itself Mill Valley. Nature has a logic that reveals itself to those who pay attention, and so do we, too. Today, Corte Madera is an ultra-wealthy suburb that is largely taken up by a shopping mall. The mall, called “Town Center,” pantomimes the trappings of what Californians might imagine functioning downtowns looked like in simpler times. There are outdoor courtyards, there is a clocktower, and boutique shops abound. Placed along the mall’s main thoroughfares are advertisements of itself: an ethnic, beautiful young woman stands in the sunshine, dressed perfectly in an outdoorsy wardrobe that cost untold hundreds of dollars; she looks out into the light with her backpack at the suggested wilderness beyond and a tagline is written underneath: You’re Marin. We’re Marin. Town Center at Corte Madera. Created with life in mind. And this is what things have come to. In a county that is—according to the last census—nearly 90% White, that is currently the fifth wealthiest in the entire nation, that exists in a landscape that is apparently beautiful but actually destroyed (and with its town names nearly bragging about it) we find shopping malls filled with corporate flagships that advertise themselves with ethnic (perfectly groomed, dressed, extremely beautiful) ciphers that stare out into suggested sunsets. We’re Marin, it claims. You’re Marin, it says, and dares you to disagree. A kind of moral outrage awoke in me, the more time I spent on the land. I began to consider the cruel irony of the “progressive,” “green” consciousness of California, and how woefully it was unable to meet its water needs – blamed in large part in the media on historic droughts, when of course the real, underlying causes had everything to do with hydraulic fracturing practices, poor land-use planning, industrial agriculture and the meat industry. How could the “progressive,” “green” bastion of San Francisco survive? Apparently by flooding Hetch Hetchy, one of the world’s great natural wonders, a Yosemite-like temple of glacially carved magnificence, and pumping away its bound up wealth like a parasite over hundreds of miles. Even as recently as 2008, San Francisco voters roundly rejected the idea to even study how they might eventually wean themselves off the water they were extracting from Hetch Hetchy. I began to feel vaguely cynical, and was especially alarmed by an experience I had during a backpacking trip I took to the High Sierras in which, despite the tremendous beauty of the area, I had ended up feeling underwhelmed in a way that depressed me. The mountains had been as spectacular as I expected them to be, but there was something mechanical, something joyless in the way I was beginning to experience them. Later, on the drive back to the Bay I stopped at Tenaya Lake in Yosemite. Sitting on the stunning, granitic shores, I realized in dumbfounded shock that staring out at the landscaped I had been thinking to myself, “Who cares?” It was, perhaps, the exact opposite experience I expected really spending time on the land would bring me. But what did it all amount to? Experiences I could pocket away like fashion accessories? Something I could uselessly recount to somebody someday as proof that I had lived? It didn’t seem to add up to much, and I began to feel bored with it. By the time Rebekah and I made it to the shores of the bay it was darker than I might have guessed, quieter than I would have imagined. It was the night of the new moon again, and the stars were obscured by the clouds, the waters left empty and bereft of anything to reflect. “I don’t think there’s anything,” Rebekah said, and was clearly disappointed. Rebekah made her way across the sands and approached the waters – although it was hard to say, exactly, where the land ended and where the bay began. It was perhaps the calmest beach I had ever encountered. Only two weeks before I had made the same journey – driving over the hill from Fairfax, winding out towards Inverness, parking my car and hiking a half mile through the shrouded stillness before making it to the same remote beach. That time there were waves, wind, moonlight. It had been cold. We hadn’t found what we came looking for. Tonight felt different, but it seemed as though we were now approaching the same disappointing outcome. I stumbled awkwardly through the darkness and used the flashlight function on my iPhone to figure out where the waters even began. The shores sat as placidly as the waterline of an undisturbed pool, and stopping a few inches from the waters, I crouched down and stuck my free hand in the coolness of the bay. “No,” I said. “Hold on.” I fumbled with my iPhone and turned off the flashlight. I stuck my hands back in the water, both of them this time, and found myself unable to see properly at first while my eyes readjusted to the darkness. I began disturbing the water, making some small splashes, by this point having little hope that we’d find what we came here to discover. “Wait. I think I see something.” And as my eyes continued to adjust to the darkness, I saw that I had indeed spoken true. Rebekah crouched down next to me and splashed her hands in the water as well. Radiating outwards from our hands, first in tight outlines and later in rippling waves, were countless little kernels of sparkling blue light. Popping electric in the darkness, sprinkling out and dispersing from my hands. Host to a special kind of bioluminescent plankton, Tomales Bay is known to have a few nights a year in which numerous factors come together in just the right way for them to become immediately perceivable. Two weeks prior I had gone out for the first time, arriving at one in the morning, seeing nothing in the water that night but foam on the waves and seaweed on the shores. Tonight, apparently, was going to be something different. Something special. Rebekah and I began to laugh at the sheer novelty of what were seeing. I tossed pebbles and rocks in the water and watched as the bay lit up blue around it. We enjoyed ourselves, but a few minutes later as I crouched down by the waters again, splashing my hands gently and watching the lights, I began to feel vaguely disheartened. I remembered my experience in the High Sierras, and how I had felt sitting at the shores of Tenaya Lake. Already I was beginning to feel similarly, sitting with the bioluminescence. Pretty little lights. A fun distraction for the evening. Something that looked cool when I threw a few vulgar rocks at it. But so what? It had been fun, but already I was bored, and began to contemplate the drive back home. The land doesn’t belong to us, I thought bitterly. We belong to the land. “I’m gonna go for a swim,” I said, somehow speaking it before I even thought about it. “You’ve got to be kidding me,” Rebekah replied, standing by the shores in her jacket and scarf and hat. I began to consider what I said for the first time, watching the popping blue kernels by my hands. It did seem a little crazy, but how bad would it really be? Worst case scenario, I’d be overwhelmed by the cold and leap back out after a few seconds. But somehow, crouching by the waters and literally not even getting my feet wet, I felt that in some small but significant way, I wasn’t doing justice to the phenomenon I was witnessing. I could see – but I couldn’t feel. I wasn’t partaking in it, somehow. I wasn’t participating. Before I could debate it much longer I started to strip down to my underwear, taking off my several layers of clothes and folding them up and placing them in the sand, my skin prickling with gooseflesh before I even managed to get out of my undershirt. Removing my socks last, I slowly began to toe at the coolness of the sand, acclimating my body to what I knew would be altogether much more shocking. I walked slowly into the bay, uneasily at first, hardly even paying attention to the lights as I trudged out, shaking from the cold, preparing myself for the plunge. Born and raised on the east coast, I admired the Pacific but viewed it largely with fear and mistrust. While the Atlantic was warm, gentle, bordering on boring, the Pacific was a brooding, dramatic power. I felt like even looking at it the wrong way would give me hypothermia – and here I was, my knees knocking in the moonless night, about to go for a midnight swim. I jumped in headfirst before I had the chance to think about it any longer. Rising from the waters a few moments later, I was shocked to find that I wasn’t that cold at all. I doggy paddled around the water in circles, situating myself and trying to figure out what came next. I was still getting used to the fact that I wasn’t cold. In fact, I felt much warmer in the water than I had felt out of it. “Hey, it’s not so bad,” I called to Rebekah, as if to confirm it for myself. “Not so bad at all.” And taking perhaps a few moments more to truly trust what my body was telling me, I finally planted my feet in the sand and stood up, allowing the upper third of my body to stand above the water. I looked all around me, and felt almost immediately that something about the experience had shifted. I wasn’t just watching it anymore – I was in it. I slowly began to walk, looking down as I watched my legs shimmer and glow with the movements of my body. I walked more, moving more confidently now, striding through the waters that lit up around me. Walking through the waters, I felt like more than just a person. My outline glowing with every movement of my body, walking through the waters I felt like some great, sacred god. It’s impossible to describe the feeling that slowly began to overtake me, but then words are always signifiers. So too, then, perhaps, are images, and all things of the senses – signs, pointing the way to a great, ultimate something that ever urges us onwards. It’s one thing to think, to believe that the universe is interpenetrating and interconnected – that everything resonates with everything else, and really we’re all a part of a web. It’s another thing to literally see it – to feel it. Spinning in circles, every thrust of my arm out before me was like a spiral arm of the Milky Way, the movements of my body giving birth to billions of glimmering stars. And the lights – the lights responded to me. If I moved slowly, they moved slowly. If I moved quickly, they worked hard to keep up. Violent or gentle, deep or shallow, no matter how I moved, no matter what I did, the lights, the bay, the whole universe, it felt like, seemed lovingly, longingly, intimately desperate to respond. I felt embedded. I felt like I was dancing. I was in the bay for at least a full half hour. After a few minutes I begged Rebekah to join me. At that point I was in such a state that had she not acquiesced I might have gone out and dragged her in myself. And although the two of us were there together, we barely spoke a word. 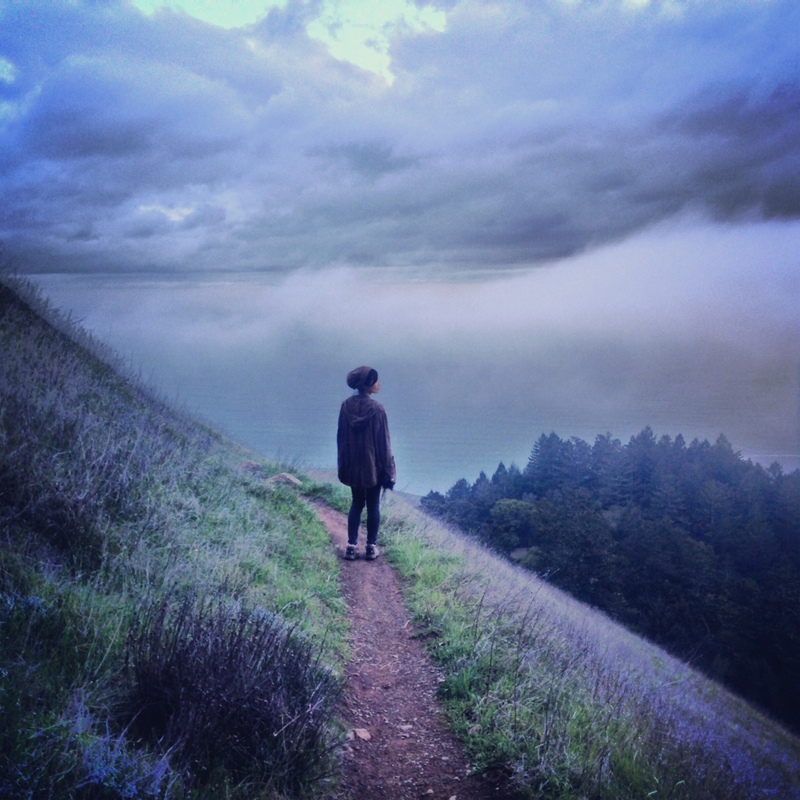 I’ve been to the Himalayas, to the Grand Canyon, to rainforests and to deserts, but there in Tomales Bay, only a half hour from where I live, at a beach that would otherwise be nondescript in the daytime, I had perhaps the most intimately spiritual encounter with nature I’ve ever had. When we finally left the beach I felt entirely different. My flashlight seemed to vandalize the landscape, and I had to turn it off, making my way through the half-mile hike back to my car in an obsidian darkness. Later, driving back home, the towns, the valleys, the development – it all seemed laughably pompous, suddenly. Defiant, and filled with vanity and hubris. I felt as though a truth had been revealed to me. I had literally seen the way the world seeks to respond and resonate. Ultimately, whether I could see it or not, that response, that resonance, that dance – that was the truth. Civilization, suddenly, just seemed like an artifice intended to pave over that truth with a narrative of its own construction. What does the land tell? And more than just the land – the sky, the waters, the stars, the moon. Who belongs to whom? If there as any particular thing I’ve “learned”—and “learning” seems somehow like a remarkably crude word to ascribe to the experiences this land has given me—it’s that there is an inter-belonging. In the end, we belong to each other. The only question is, are we willing to listen? Are we willing to mutually respond? love the pictures … especially the ‘darkness falls’ …. want to hike !